At our DRY EYE CENTER, Dr. Thomas Liner and Dr Richard Liner provide the highest level of expert Dry Eye Services utilizing the most up-to-date and aggressive treatment options available. We have treatment and information stations all throughout the office, including each examination room, in order to provide you with the most advanced information and how specific treatment options may benefit you. It is estimated that one in five adults suffer from the symptoms of Dry Eye Syndrome (see the list of common symptoms below). If these symptoms are familiar to you. WE CAN HELP. 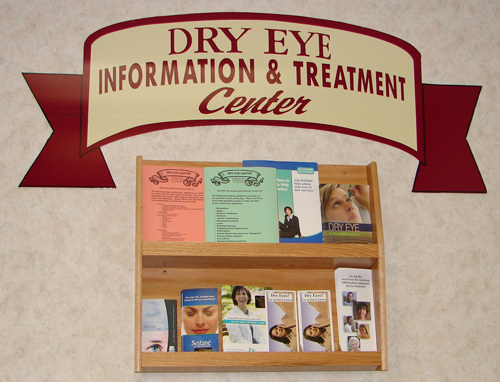 We invite you to contact us to schedule your Dry Eye evaluation today. WHAT FACTORS INFLUENCE DRY EYE? Dry Eye Syndrome is a general term used to describe various disorders of the tear film causing an imbalance in the quality or quantity of tears. The result is a decrease in the production of tears or an excessive evaporation of the “water” in the tears. Inflammation and eye lid disease also play a role. This results in the tear film’s protective barrier being compromised. What are Factors that Influence Dry Eye? Hormone changes from pregnancy, oral contraceptives, menstruation, and post-menopause. Certain medications can decrease the body’s ability to create tears. Some examples include antidepressants, diuretics, decongestants, antihistamines, Beta-blockers, hormone replacement therapy, oral contraceptives and tranquilizers. 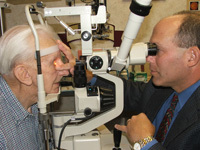 These procedures surgically alter the cornea, which may lead to Dry Eye symptoms for up to several months potentially. Initially, high quality artificial tear lubricating drops will be recommended. These are “over the counter” products. If your symptoms are at a minor level or are very intermittent, these drops can be used “as needed”. However, if your symptoms are at a moderate to severe level, (experiencing symptoms weekly to even daily) then using drops 3 to 4 times daily will be advised. Lubricating ointments for nightly bedtime use may also be advised. We only recommend the most advanced lubricating eye drops on the market today. Older products or generics often are not equivalent and will not be as beneficial to you. We will discuss in detail which products will benefit you most during your Dry Eye evaluation. For moderate to more severe Dry Eye, we employ the following therapeutic options, often in combination. Theses options WILL make your eyes more comfortable. You do not have to suffer with the irritating symptoms of Dry Eye disease! When successfully treated, it is common to be able to decrease the frequency of lubricating eye drops or stop them all together. This procedure involves placing a very small silicone or acrylic plug, approximately .1mm wide by 1.5mm long, into the lower lid drainage opening (punctum). It takes about one minute or less to complete and is completely painless. By partially blocking were tears drain from the eye, this allows your tears to remain on your eye surface (cornea and conjunctiva) much longer than normal. Once inserted, your dry eye symptoms will typically improve significantly. In addition, the vast majority of patients can reduce the use of artificial tears or often discontinue them all together and remain very comfortable. A prescription eye drop medication (cyclosporine .05%) instilled twice a day. Reduces inflammation as well as increases tear production. These are called “essential” because they are a necessary part of ones diet to maintain good health. However, Omega 3 oils help to reduce inflammation in the eyelids, allowing a healthier oil layer of the tear film to be produced. This reduces tear evaporation and improves comfort. Chronic inflammation and/or infection of the eyelids (Blepharitis) significantly contribute to Dry Eye disease. Resolving the inflammation or infection is very important. This is accomplished by a combination of warm compresses over the lids, followed by lid margin scrubs to remove the debris. Commercial over the counter preparations are available for this purpose, such as TheraTears Sterilid Eyelid Cleanser and Ocusoft Eyelid Cleanser. If needed, a combination antibiotic-steroid ophthalmic prescription ointment applied to the lid margins may be used as well. Steroid prescription eye drops are used in moderate to severe cases of Dry Eye disease when significant inflammation is present. Steroid drops reduce the inflammation on the surface of the eye.